School’s out, summer is in, so let the fun begin with the Mega Sun Inflatable Dual-Lane Slide rental! This dual-lane inflatable slide showcases our own Mr. Heat Ray, features two slides, and is sure to be a “hot hit” at your party. Why not double the fun by turning this slide into a fun competition for your guests. Competitors will climb up the safety-padded foam steps to the 10’ high enclosed slide platform, then “catch the heat wave” while they race and slide (safely, one at a time, feet first) down to the inflatable landing area! Feel safe when your little ones climb and slide this inflatable rental: this dual-lane inflatable slide has many safety features, including full length containment walls separating climbers from sliders, a single fully enclosed loading deck for both slides, bumper rails the length of the slides, and bumpers at the end of the slides’ landing areas to ensure no one slides directly onto the ground. 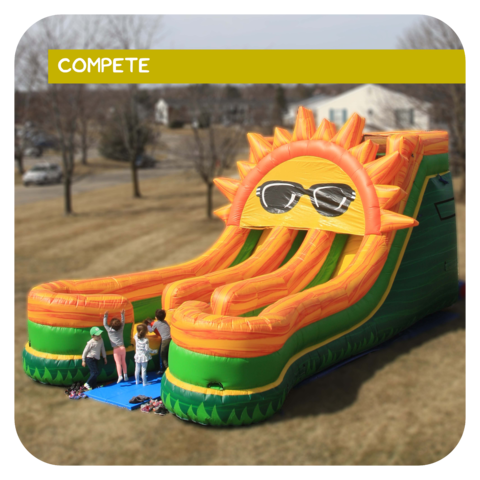 Bring the Mega Sun Inflatable Dual-Lane Slide to your event and watch your guests have fun in the sun! Safety is our top priority, above everything, EVEN FUN (sorry, kids!). 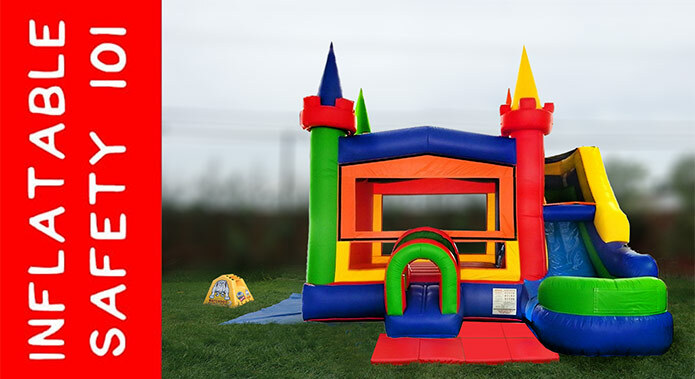 This inflatable slide rental includes a Watchdog Series 2 Blower Siren (to detect blower malfunction or other loss of air) and ASTM-approved, 2" thick, non-slip safety/landing mats (to create a safer area around the entrances/exits of your slide rental), as well as 18" stakes to properly anchor your slide rental - all free of charge! While we do our best to source the safest inflatable rentals, slips, trips and falls can occur, especially without proper supervision to ensure all Inflatable Safety & Operating Instructions are followed at all times. Looking for even more entertainment for those hot summer days? Check out our "Splash" category for an extensive selection of water slides and water slide bounce house combos! We also have many other inflatable dry slides and bounce house slide combos in our "Slide" category! Oh, and don't forget to check out our Tent & Table Rentals as well as our Cotton Candy, Snow Cone, and Popcorn Machine Rentals, too!